Housed in a compact aluminum pod measuring just 2.2in in diameter and 2.4in deep, the D2 LED light is perhaps the most versatile design available; powerful enough to be your “primary” driving light yet small and light enough to comfortably mount on a fender. The DENALI D2s feature durable black powder-coated finishes and special cooling fins to make sure the LED itself runs cool and bright. New for the DENALI 2.0 series is a special Impact PC™ corrosion proof bezel that ensures your lights will continue to look great even after repeated stone and debris impacts. Low profile hinge mounts offer secure mounting and include stainless steel M8 mounting hardware for installation on light bars or model specific light mounts. The D2 2.0 kit uses a just-developed HotSwap™ modular wiring harness that, by default, causes these single intensity lights to function at full brightness. But if you would like them to operate at both half and full power, simply add the dual intensity DataDim™ controller. No other changes are required except to replace the original relay with the DataDim™ module and connect one wire to the high-beam circuit. Used on the Analog XS650 Reloaded custom. 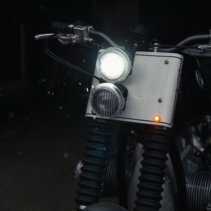 We at Analog have fabricated brackets to utilize this lighting on our XS650 Reloaded build, seen in the attached pictures. Get creative and fabricate a bracket to mount to your project to match your style and build! These are not DOT-approved, lights are for off-road use only. Full specs and kit components listed below. Dual Intensity functionality requires the optional DataDim Dual-Intensity Controller (Part# AMG.WHS.11000), sold separately. Also new with the DENALI 2.0 generation of lighting is the industry-leading TriOptic™ lens system. The lamp comes with both spot (installed) and flood (supplied) lenses, nothing else to buy. 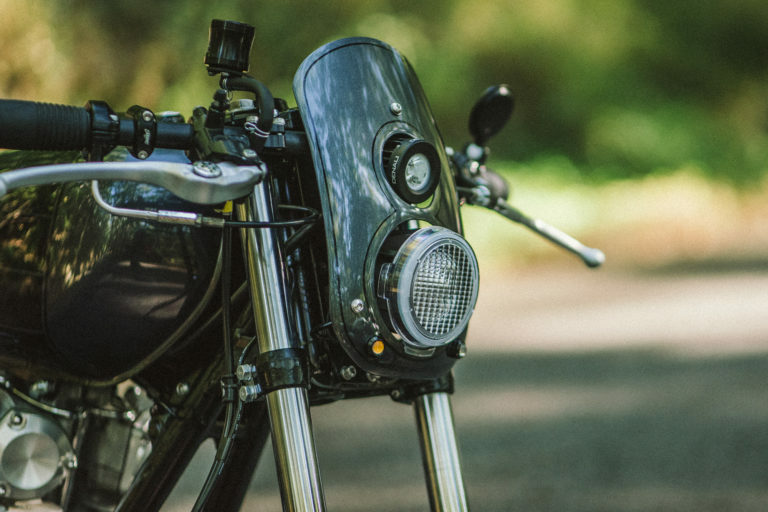 The spot lens produces the greatest beam distance, while the flood lens produces a broader spread of light closer to the motorcycle, filling the road edge and shoulders. To get the best of both worlds, use a spot lens on one light and a flood lens on the other light for distance illumination and a useful spread of light at close range. The flood lenses E-Marked to be road legal in countries where this is a requirement. No matter which lens you choose, the D2 2.0 light kit lets you see the road (or lack thereof) and be seen by other traffic around you. It’s that simple: See further, be seen better, with DENALI! Designed specifically for motorcycles, the DENALI 2.0 LED TriOptic auxiliary lights with DataDim technology maximize visibility in an extremely durable, efficient, compact yet very powerful package. This product line, like all DENALI products, carries a 5-year warranty.